SeeSaw is reported to have launched with over 3,000 hours of content. While a deal with ITV has yet to be made, the other UK Freeview broadcasters are present, almost. Content from Channel Four’s 4oD and Five’s Demand Five is provided, but the BBC have unsurprisingly stuck with iPlayer for their current catch-up content . However, SeeSaw has a deal for a wide range of content from the BBC’s commercial wing, BBC Worldwide. As reported here, other content deals have been made too. While they have yet to make a deal with ITV, independent deals exist for a number of series featured on ITV, such as “Footballers Wives”, “Kingdom” and “Doc Martin”. There have also been deals for sports content, including Olympic highlights and the 2010 Football World Cup. Moving on to the site itself, content is logically laid out, and can be filtered by either genre or channel, but not both. Once browsing a channel or genre, programmes can be further filtered by the first letter of their title. For those who know exactly what they’re looking for there’s a search box which auto-suggests programmes as you type. For family viewing, SeeSaw also provides parental controls for restricting access. The flash player on SeeSaw is well thought out. There is a “turn the lights out” feature, just as with YouTube and Hulu, and there is of course a full screen toggle. The player page also features two columns beneath the player, one with programme details (cast & crew, etc. ), and another column that shows links to other episodes from the same series, where applicable. 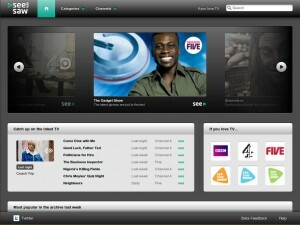 There are options to stream at low, medium, or high quality, although these settings are not available on 4oD content. In tests for this review, at peak times with a downstream connection of 1.3Mbps, SeeSaw regularly threw up the “Your internet connection speed is too slow” message, even for the low quality setting. This despite SeeSaw’s minimum recommendation of a 1Mbps connection for viewing. On the bright side, we observed that some content, namely Demand Five content, streamed more smoothly from SeeSaw than from Five’s own website. Two factors could account for this: 1) There’s less demand on SeeSaw’s servers than Five’s; 2) Five uses a higher bitrate than SeeSaw’s low quality setting. There are some confusing aspects to SeeSaw as well. For instance, the home page has a section called “Catch up on the latest TV”, listing programmes and when they were last shown on TV; e.g. “Last week” or “Yesterday”. It would seem natural to assume that further to this box, there would be a page with a longer list of recent programmes. As far as we can see, there isn’t. Worst of all with SeeSaw is that it isn’t clear what you can and can’t view on the site. The BBC Worldwide selection is just that – selective. Also, the viewer is left to assume that whatever they can view on 4oD or Demand Five, they can view on SeeSaw. We have yet to see this stated in black and white. 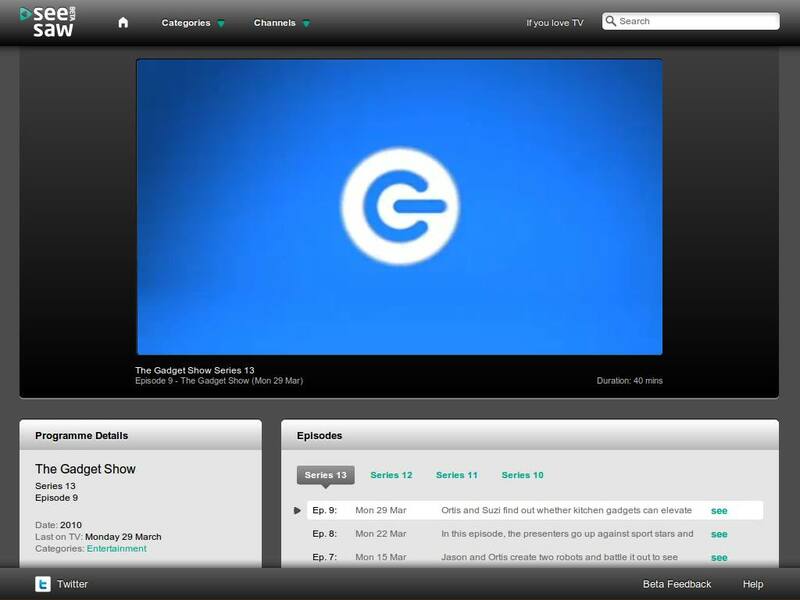 Naturally though, SeeSaw doesn’t have the rights to show programmes imported by Channel Four or Five, e.g. The Daily Show with Jon Stewart. Overall, SeeSaw is a well designed video on demand site. However, it is a confusing mixture of current catch-up material and back-catalogue content. With more deals, and thus content, yet to come, it will certainly remain on last100’s radar. How can I access SeeSaw from outside the UK? At $55 a year, you won't find a VPN better deal – high-speed and dependable.